Positive economic trend has become clearer in 2017 with national GDP expanded at 3 percent which is an increase from the previous year and is faster than forecast. This is in line with higher consumption in the private sector. In 2018, the Fiscal Policy Office expected national economy to continue to grow at 3.8 percent. Another factor clearly reflects strong investors’ confidence is SET Index which grew from 2016 by over 13 percent in 2017 and made a new record high in the Stock Exchange of Thailand’s 43-year history when the market resumed on the first trading day of 2018. On 16 June 2017, the Stock Exchange of Thailand announced the list of securities used as base for SET50 and SET100 Indices calculation and the list included RATCH as one of the securities used to calculate both SET50 and SET100 Indices. Furthermore, the Company was also chosen as Thailand Sustainability Investment 2017 for the 3rd consecutive year by the Stock Exchange of Thailand, which underlines the Company’s strength and investors’ confidence. Despite all these sucesses, the Company has never stopped strengthening and developing capability in the organization in order to achieve continuous growth and the goal to be a leading value-oriented integrated energy company in Asia-Pacific. Our key strategies remain center around adding value to our business to promote continuous growth, optimizing our assets, and developing new power plants in Thailand and other countries. Furthermore, the Company seeks new partners to expand our business opportunity in the power business and also seeks new opportunities and alternatives in other related businesses. These strategies will continuously create the highest financial return, which also add value to our shareholders and support the Company’s sustainability. In 2017, the Company’s commercially operating power plants have a combined capacity of 6,496 MW. Such power plants includes Ratchaburi Power Plant, Tri Energy Power Plant, Ratchaburi Power’s Power Plant, Ratchaburi World SPP Power Plant, Nava Nakorn SPP Power Plant, Huay Bong 2 and 3 Wind-Turbine Power Plants, Solarta Power Plant, Solar Power Korat 3, 4 and 7 Power Plants, Songkhla Biomass Power Plant, as well as Nam Ngum 2 Hydroelectric Power Plant, and Hongsa Thermal Power Plant in Lao PDR, and thermal and wind-turbine power plants in Australia. The Company also has other related businesses, including power plant operations and management services by Chubu Ratchaburi Electric Services Company Limited and RATCH-Lao Services Company Limited. These power plants and related businesses generated Baht 45,573 million revenue to the Company in 2017. In addition, there are power plant projects and other businesses that are under construction and development, which account for the equivalent of 884 MW installed capacity. Such projects include: Mount Emerald Wind Farm, Collinsville Solar Farm, System Restart Service by Kemerton Power Plant in Australia, all three of which will be completed and start commercial operations in 2018; Xe-Pian Xe-Namnoy Hydroelectric Power Plant in Lao PDR and Berkprai Cogeneration SPP Power Plant in Ratchaburi, which are scheduled for completion and commercial operation in 2019; the MRT Pink Line Project (Khae Rai - Min Buri), and the MRT Yellow Line Project (Lat Phrao - Samrong) which are scheduled for completion and commercial operations in 2021; and Fangchenggang II Nuclear Power Plant in the People’s Republic of China and the Riau Combined Cycle Power Plant in the Republic of Indonesia, which are scheduled to be completed and begin commercial operation in 2021. In terms of 2017 operating result, the Company continued to generate satisfactory profit, which strongly reflects our capacity to carefully invest in efficient and effective projects and strengthen our financial position. In 2017, the Company and subsidiaries have a total income of Baht 46,438 million and profit of Baht 6,107 million, which is around the same level to those of the previous year. Another clear testimony of our strong financial position and careful investment is the corporate credit rating which is maintained at “AAA” level, the highest corporate credit rating level, according to TRIS Rating with “stable” trend. This confirms the Company’s leadership as the country’s largest private power producer with stable cash flow from power plant investment, a strong portfolio of power purchasers who have high financial credibility, and close relations with Electricity Generating Authority of Thailand. In addition, the “Stable” credit rating trend reflects firm cash flow from our investment in power plant with long-term power purchase agreement. It is expected that our debt to equity ratio to be maintained at an appropriate level when considering our growth and investment plan. As for good corporate governance, the Company continues to adhere to good corporate governance principle while focusing on creating sustainable value to our business, operating business with responsibility towards society and the environment, operating with ethics, integrity and transparency, as well as equitably treatment to all stakeholders. 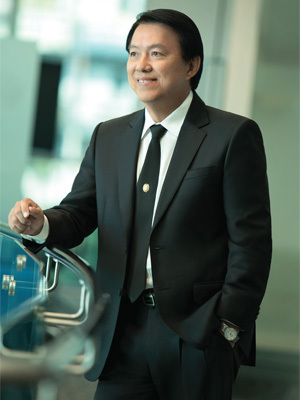 With such commitment and practice, the Company was rated “Excellence” in the corporate governance report assessment from Corporate Governance Report of Thai Listed Companies 2017 Project held by the Stock Exchange of Thailand in cooperation with the Securities and Exchange Commission, and Thai Institute of Directors Association. The Company’s total score is 93, which is higher than the average scoring of 80 of all the 620 participating listed companies. We also received the Sustainability Report Award 2017 for the 5th consecutive year from the CSR Club, the Thai Listed Company Association in cooperation with SEC and Thaipat Institute. In terms of social and environmental care, the Company continues to keep our focus on this area and introduces it through various projects and activities such as Love Forests and Community Project, Carbon Sink and Biodiversity Study in Community Forests Project, Community Energy Project, @CareLine Happy Community Network Project, Happy Elderly, Healthy Thailand Project, Pumaree - Women’s Power Protecting the Environment Project, volunteer and employee activities. These projects cover various areas such as energy conservation, efficient resource optimization, community forest development to increase carbon sink and reduce Global Warming, health care promotion for the elderly, safety and health awareness raising for young people and promotion of sharing spirit and social responsibility among employees. On behalf of the Board of Directors, the executives and employees, I wish to express my sincerest appreciation to the shareholders and stakeholders for your continuous support. We strongly believe that the operations under our preset strategies will enable the Company to grow and achieve our vision of being a leader in value-oriented energy company in Asia-Pacific in the near future.